In this article, I will explain you, how to call asp.net web API in your angular project step by step. 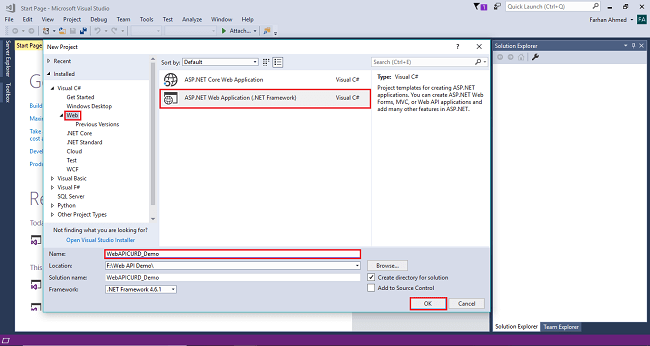 You need to enable cros in your web API and fetch data from web API. It easy to call API in angular. 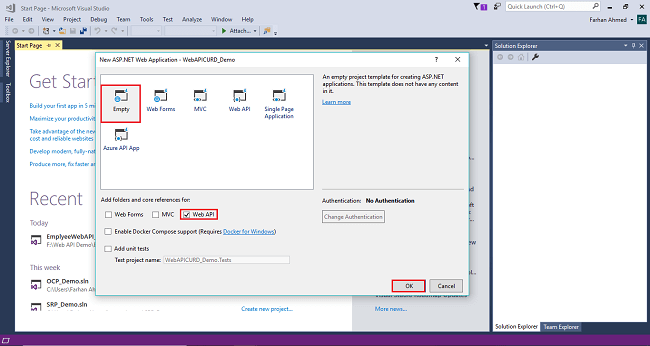 In this article, I will explain how to call ASP.NET web API in your Angular project step by step. 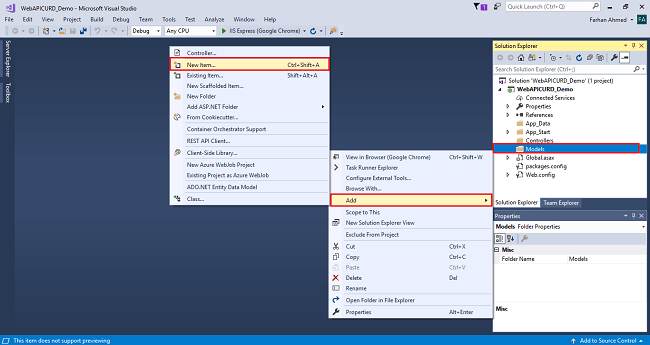 You need to enable CORS in your web API and fetch data from web API. It is easy to call API in Angular. 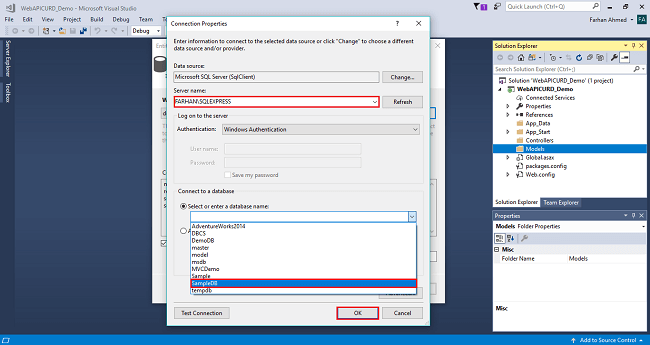 Open SQL server 2014 of your choice and create a table and insert some records. 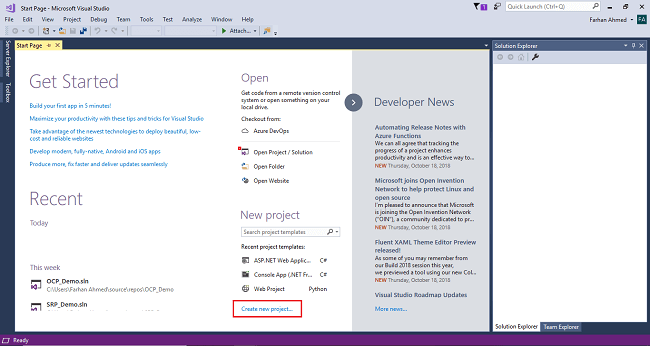 Open Visual Studio 2017, click on New Project and create an empty web API application project. After clicking on New Project, one window will appear. Select Web from the left panel, choose ASP.NET Web Application, give a meaningful name to your project, and then click on OK as shown in the below screenshot. After clicking on OK one more window will appear; choose empty, check on empty Web API checkbox then click on OK as shown in the below screenshot. After clicking OK, the project will be created with the name of WebAPICRUD_Demo. 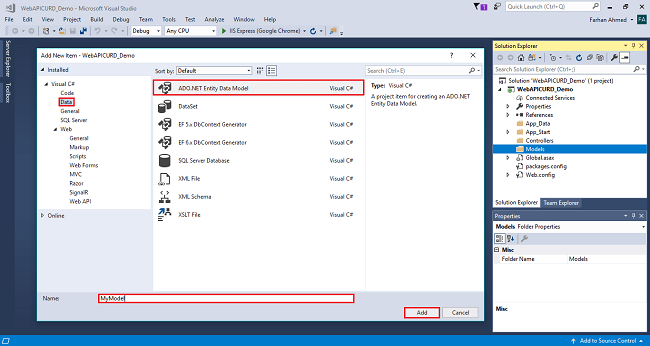 Add Entity Framework now. For that, right click on Models folder, select Add, then select New Item, then click on it. 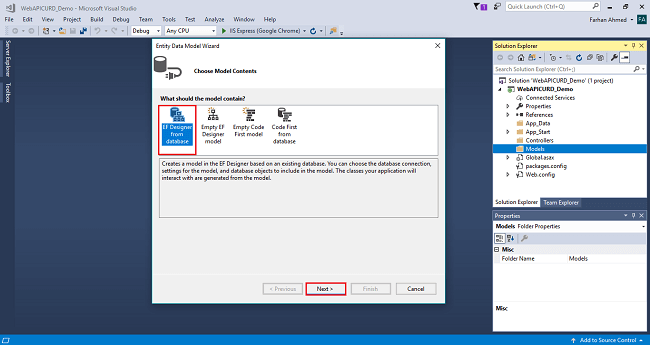 After clicking on a New item, you will get a window; from there, select Data from the left panel and choose ADO.NET Entity Data Model, give it the name MyModel (this name is not mandatory you can give any name) and click on Add. After you click on "Add a window", the wizard will open, choose EF Designer from the database and click Next. After clicking on Next a window will appear. Choose New Connection. Another window will appear, add your server name if it is local then enter a dot (.). Choose your database and click on OK. The connection will be added. If you wish to save connect as you want. You can change the name of your connection below. It will save connection in web config then click on Next. After clicking on NEXT another window will appear to choose database table name as shown in the below screenshot then click on Finish. 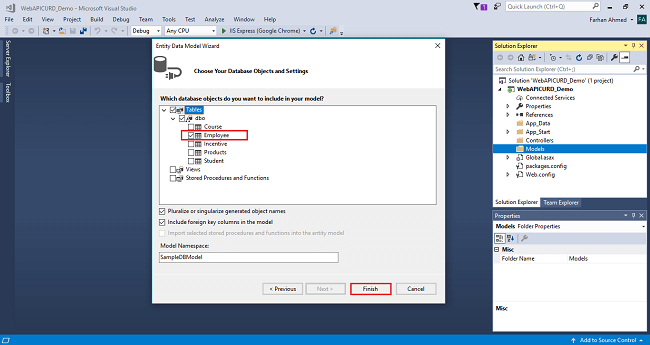 Entity framework will be added and the respective class gets generated under the Models folder. Right click on Controllers folder, select Add, then choose Controller as shown in the below screenshot. 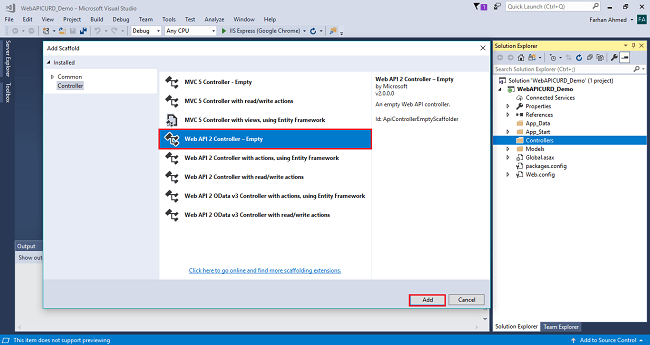 After clicking on the controller a window will appear to choose Web API 2 Controller-Empty, click on Add. 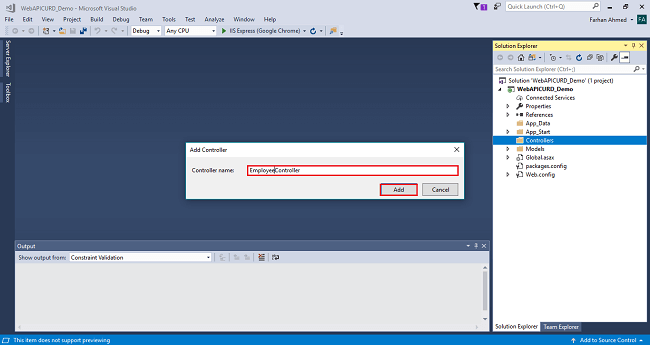 After clicking on Add, another window will appear with DefaultController. Change the name to EmployeeController then click on Add. EmployeeController will be added under Controllers folder. Remember don’t change the Controller suffix for all controllers, change only highlight, and instead of Default just change Home as shown in the below screenshot. Now, enable CORS in the WebService app. 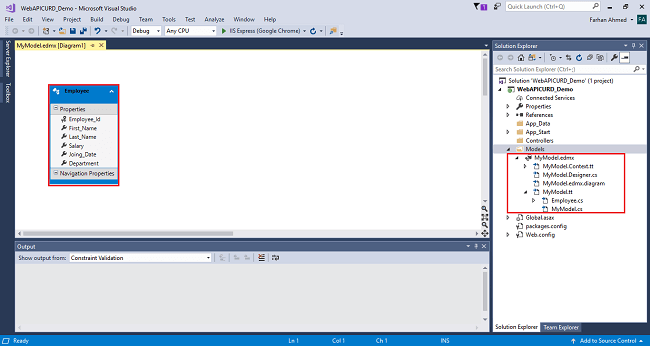 First, add the CORS NuGet package. 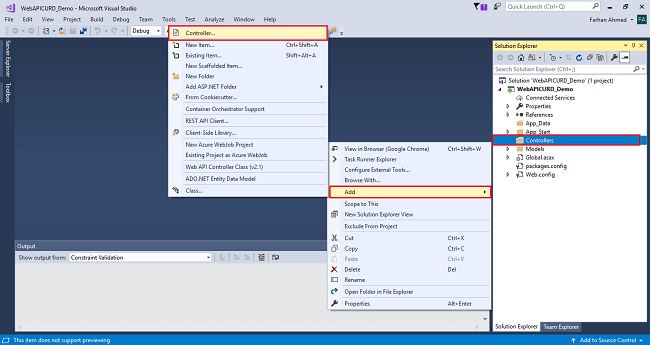 In Visual Studio, from the Tools menu, select NuGet Package Manager, then select Package Manager Console. In the Package Manager Console window, type the following command. This command installs the latest package and updates all dependencies, including the core Web API libraries. Open the file App_Start/WebApiConfig.cs. Add the following code to the WebApiConfig.Register method. Open Visual Studio Code and create a new Angular project. Run your project in browser.